This Is It. Photo by Michael Horne. In 1968 June Brehm, who had been running a supper club in Butler, decided she wanted to be in downtown Milwaukee. When she discovered an available tavern in a mostly vacant office building at 418 E. Wells St., she said, “This is it!” and opened shop under that name. 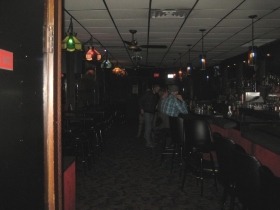 Today the 50-person capacity lounge claims to be the oldest continuously operating gay bar in the state, and is one of the dwindling number of such establishments in the city of Milwaukee. June died in 2010, but for most of that time the place was effectively managed by her son Joe, who, at 72, retains an 80 percent ownership stake, while it is now operated by George Schneider, 30, who owns the remaining share of the business. The 18-foot-by-60-foot rectangle is located at the west end of a 1915 commercial building on the northwest corner of E. Wells and N. Jefferson streets that also houses the offices of the Milwaukee Bar Association on the second floor. The remaining portion of the ground floor is Louise’s Trattoria, an Italian chain restaurant that opened around 1990. 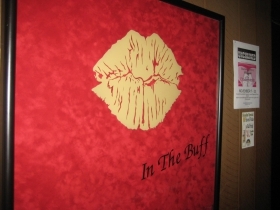 When This Is It first opened, the gay bar scene was largely underground. The tavern had a front and a rear entrance, with the latter being favored by the mostly closeted clientele, including some of rather distinguished social pedigree and attainment. The dim lights and rear exit allowed for an easy escape for patrons who might not have wanted to be seen in such an establishment. Inside, the narrow tavern offered solace, comfort and companionship, and such is the case today, when the stigma of gayness is unknown to a new generation of tavern-goers. The place has always been clean and well-decorated, with genuine stained-glass fixtures and large, flocked mirrors behind the bar. A row of booths was installed on the west wall in 1969, and only quite recently removed, to be replaced with additional seating for the increasingly large crowds who have found the place. 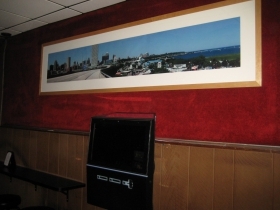 A large jukebox has been replaced by a computer model, and a cigarette machine is long gone. (Regrettably, the default music is commercial FM radio, which is a shame for a building that is on the same block as the studios of WMSE. So stuff the jukebox with cash and carry on.) Two video monitors run a slideshow of photos of customers at the bar over the years. A sports bar this ain’t. The Red Phone. Photo by Michael Horne. A pay telephone remains on the south wall. People use it today just to call friends to tell them they are speaking from a pay phone. Another telephone relic is on the bar — a red device sans dial, used for incoming calls only. June was not one to pay for her bartenders’ calls to their buddies! Decorations are minimal, except for the holidays, when the place can erupt into a fantasy world according to the season. That’s what you get when you operate a bar that attracts florists and interior decorators among the clientele. 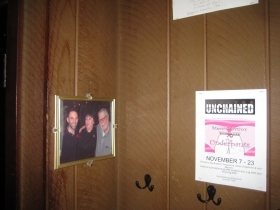 Recent fantasies of decor included a Lucky Charms motif last March, as well as a rather comprehensive tribute to Betty White, which included an audio soundtrack of her reading from her autobiography, broadcast on speakers in the men’s room. Today, the recently remodeled men’s room’s soundtrack is that of water and washing-up sounds. Above the tile wainscoting is a Bogart-themed strip of wallpaper, the butchest thing in the whole joint. Even during the dark underground days of gay life, This Is It maintained a police record as spotless as the bar itself. It was, and is, orderly and respectable, and safety has never been a concern for the authorities or customers. During the early days of This Is It, Downtown was dead. The immediate area was full of empty lots, and nearby surface parking was one of the tavern’s attractions. We forget at our peril how absolutely desolate our vibrant city was for so many years. The place is dimly lit, but at twice the wattage of the early years. Illumination comes from very nicely made stained glass fixtures, some of rather considerable vintage, and possibly of Middle Eastern origin; others are locally made. Three ceiling fans keep the air moving. There is a disco ball hanging at the center of the bar, but it is rarely illuminated. Those five mirrors behind the bar look like the type that are usually made of little squares of glass, but these are all large units, composed of single panes, a good four feet square or better. There are 20 padded, swiveling seats along the bar, which is “L” shaped, offering captain’s seating at the south end, by the pay phone and a small office where June would count the receipts each morning. In 1938, children playing with matches set fire to rubbish at the rear of the building. Those kids! They probably came across the river from the West Side. Yankee Hill children would never engage in such mischief. In 1952 Vern Johnson operated the location as Vern’s Tap, and a Pabst Blue Ribbon Beer sign hung outside the door. It was known as “The Establishment” for about a year before June bought it from Frank Cicerello, who introduced air conditioning to the place, and put an Andeker sign out front. In 1969 the tavern assumed its present form, including the concrete block front that mars the building’s exterior to this day. At the same time the walls were paneled, and the ceiling lowered, elements that remain. “PROVIDE ADEQUATE VISIBILITY,” H. H. Wolf of the City’s License Bureau wrote when approving the plans. In 1970 the tavern was partly destroyed by fire, but these things happen, even when kids aren’t playing with matches. That year a revolving Miller Beer clock sign was installed, and a skeleton sign was erected on the back door reading “THIS IS IT ENTRANCE,” as a guide for the closeted customers. In 1972 a Pabst Blue Ribbon FOOD sign was installed at the front of the tavern, but with the arrival of Louise’s and the Milwaukee Bar Association, the sign was taken down, and the bar remained signless until quite recently when a “This Is It” flag was put up. A sign in the small window reads “Are You Looking for a Sign? This is it.” Clever. 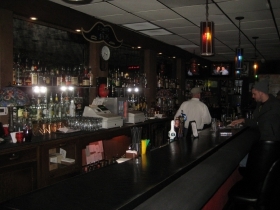 The bar offers numerous specials, one lovely tradition of gay bars in the city. Happy hour drinks are a dollar off, with numerous discounts on bottled beverages and cocktails. Tuesdays offers progressive discounts the more you drink– a half a buck off the first, then a dollar off the next, then a buck fifty, then 2-4-1. Then you better be going home. Bring the leftover chips back next Tuesday. On Sundays you get a wristband, with the best deals early in the afternoon. There are 3-for-1 Fridays, and a special deal whenever the disco ball drops. Other specials apply, some so complicated only an accountant could understand them. Just show up and drink. Description: State’s oldest gay bar has adapted to the times. Clean, comfortable, conversational. Fair number of professionals after work; late night crowd includes many hotel and restaurant workers. The occasional straight guy on the down low. Food: Used to have quite an array of candy bars; now you can get some pretzels. Real Chili is across the street; eat there. Signature Drink: Consult the almanac to find out what’s on special and drink that. 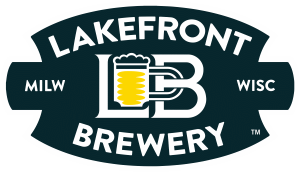 Capacity: 80 in 1,200 square foot tavern. 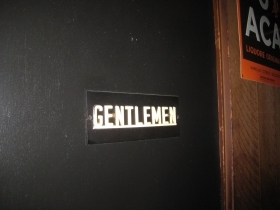 Restrooms: One for men, one for women. Year Established: Under continuous ownership since 1968; tavern since 1936. Year Building Constructed: Built 1915 as commercial building. Rare instance of non-freestanding Milwaukee tavern. Estimated Annual Rent: $23,352 according to assessor’s calculations. Transit Score 75 out of 100, “Excellent Transit.” Will be better once mayor gets streetcar running here. Games of Chance: None of those tacky machines here. Games of Skill: None. We are not here to play games, and that includes dice. Aldermanic District: 4th, Bob Bauman. Many a night, after going out dancing (remember Papagaios, Club Marilyn, The Factory, La Cage?) everyone would end up at This Is It for last-minute drinks – many of us have such an affection for it because of those yesteryear times! I left Milwaukee over 30 years ago. I’m coming up to visit an old friend, taking Amtrak. I told her I’d find some watering hole until she gets off work. She suggested a bar on Jefferson and something. I replied “Jefferson and something? It’s been over 30 years. I wonder if it’s This Is It?” Sure enough. I haven’t been there in probably 35 years. Looking forward to some nostalgia.